Reading the comments from last week, it didn’t escape my attention that I was in the minority in my appreciation of “Search And Recovery.” Several of you pointed out that in my focus on the Tom and Pope-centric high jinks of the episode’s main plot, I largely ignored the secondary plot about Weaver’s search-and-rescue team and how its attendant mawkishness dragged down every scene it was featured in. Part of that was the fact that I was so pleased to see the show taking a new structural direction that I was prepared to forgive it a lot of things, and part of that was because I felt it would be a waste of everyone’s time to talk in depth about a plot that went absolutely nowhere and failed to keep my attention. 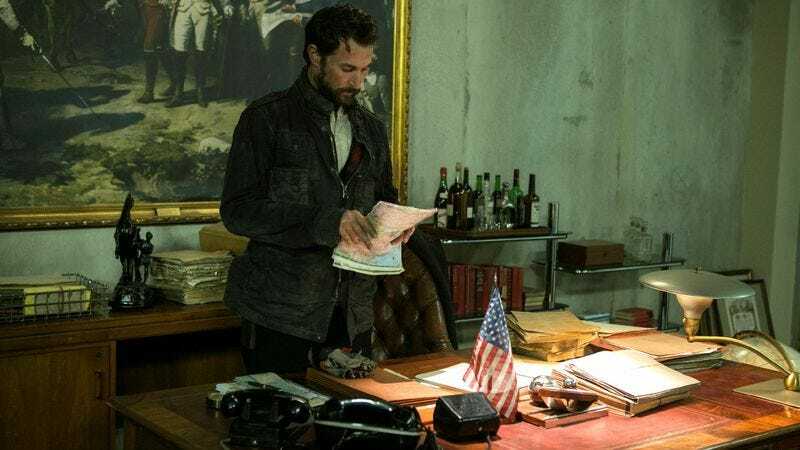 I’ve spent a lot of time discussing how Falling Skies has numerous structural problems it’s unwilling to solve, a penchant for overwrought dialogue and stupid decisions that get in the way of enjoying the action, and when it does something new I’d rather spend my time on that. Unfortunately, “Be Silent And Come Out” was an episode that lacked anything new to attract my attention, and also one that proved to be full of many of the problems that have plagued the show since the beginning. The episode resolves one of the many subplots that have been introduced for the third season, the incorporation of Evil!Hal and his potential threats to the resistance, but it does so in a fashion that fails to make any part of that story (save a visually impressive denouement) particularly complicated or interesting. It factors into what’s coming across as a far less disciplined season of Falling Skies, one that’s been trying a lot of different things between mad scientists/demon babies/alien superweapons, and for the most part not being terribly successful with any of them. There’s one thing that does remain constant in the early goings, as Tom proves intractably stubborn in single-mindedly pursuing the safety of his family. Now aware of happened with Anne and Alexis, he vows to head out in pursuit of them and is only held back by agreeing to give the rebel skitters 24 hours to track down some intelligence. This is a beat that we’ve seen about 300 times before on the course of the show, and the arguments made for and against it are so repetitive they cross over into dull. At this point I’m on the side of characters like Marina, who are actively questioning his decisions and talking about more interesting plot elements like the Volm alliance and their mystery device. This was set up at the start of the season as as a major seismic shift to the show’s world, and it’s been woefully underplayed in favor of the same interpersonal conflicts. The end of this discussion seems like things will be taking a different twist, as the show takes a welcome abrupt left turn as Evil!Hal reveals himself, knocking Marina unconscious and taking Tom hostage with the intent of delivering him to Karen. It’s an unexpected move that’s legitimately interesting but one that’s compressed almost immediately: Tom’s mentioned before that his new United States only takes up a total of a few blocks, and here the action feels small and coincidental to an absurd extent. Maggie just happens to be a minute away to hear Marina’s cry for help, and then just happens to be a block away from the machine gun emplacement that Evil!Hal just happens to be driving past. And then adding to the show’s legacy of bad decisions, she opens fire on the vehicle and sends it spinning in a manner that seems like it should kill its passengers and it’s solely by dumb luck the Masons survive. Hal then drags Tom to an abandoned building and demands a new car to get him back to the Espheni rendezvous. The hostage situation means that Evil!Hal gets to take center stage, and unfortunately the character doesn’t live up to early expectations. I was hoping that giving Drew Roy some different material would help the character become more interesting, but the performance is largely over-the-top and hammy, sneering at Tom about killing off his other sons and going through a series of elaborate facial gestures as the alien and human war for dominance. And Tom’s erstwhile efforts to bring his son under control aren’t any more compelling, the character weakly reaching for an admittance that the tensions they had before the invasion are still there—a reveal I’d be more inclined to take seriously if there’d been any evidence of that over the last season and a half when these problems were first discussed. The scene’s meant to be tense and dramatic but the pacing feels off in general, and given that Tom tries and fails to subdue Evil!Hal at least three times it also becomes repetitive. The episode’s third act is an improvement, largely because it lets Falling Skies indulge its taste for creepy imagery. Consulting with the rebel skitters, Tom learns that there is an experimental hunter-killer device that can infiltrate Hal’s body and purge the bug, though one that runs the risk of killing the younger Mason if no bug is present. Tom opts to go through with the procedure, and the result is disturbing to say the least: A pod is drilled out from an amber-like coating and a cloud of nanomachines pours out, seeping into Hal’s face and popping his veins out in black, Dark Willow-style. In this moment Roy expresses raw panic, which plays much better than his earlier hamminess—a panic that seems justified as he winds up coughing metallic spittle and his heart stops. An adrenaline shot brings him back, and the death of Evil!Hal is a sure thing, returning the character to his solely competent state. And allowing people to collect their 150-to-1 odd longshot bets turns out to be Tom’s last act as president, as he resigns the position effective immediately and hands the reins of power over to Marina. This is the final decision proving that Tom deserves a slot amongst the least effectual fictional presidents ever, as for the course of his administration he’s been all too willing to put himself on the front line and seemed largely uninterested in the day-to-day. Finally, the character acknowledges that leadership isn’t his strong suit, and he places himself in the position he’s clearly most comfortable in: riding to the rescue of his family, as he departs Charleston with his sons in tow on a rescue mission. I’d like to hope that as with Tom and Pope’s adventure last week sending the Masons off from Charleston will lead to more interesting adventures on the road, but after this week confidence has ebbed considerably. 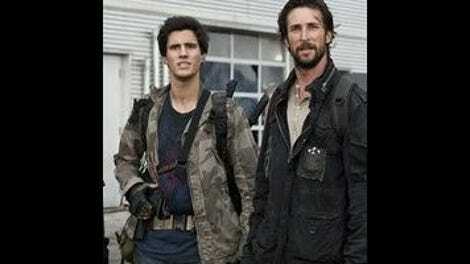 My complaints obviously don’t matter much to TNT, as Falling Skies was renewed for a fourth season last week. In hindsight, last week’s grade was probably too high given the attendant annoyances. Let’s retcon to a B+ as I still think the Tom/Pope stuff was good enough to overcome most of them, but probably not enough to push the episode up to “Molon Labe” levels. Once again, Pope proves himself the show’s most entertaining character by taking advantage of the “latest Mason family drama” to hold a betting pool at his bar, offering 50-to-1 odds of both dying and 150-to-1 odds on both surviving, with a side pool on what charges are leveled against Hal. Pope’s betting pool also leads to one of Will Patton’s best moments in a long while, as Weaver breaks up the action by stopping in for a drink and offering a not-so-subtle threat: “If anyone tries to affect the odds on that boy, one way or another, I will personally mount your head on the wall of this establishment.” Pope gets the message immediately and dispatches Lyle to make sure Hal stays (relatively) safe. Mole Watch: I still refuse to believe that Hal’s the only mole, and Marina still seems likely to me as her role as president and Weaver’s potential love interest seems to be building to a dark twist. Most of you seem convinced it’s Lourdes, which I support if only because it would justify why Lourdes is still on the show. Maggie says that Hal’s been having “emotional problems.” Head-slapping understatement of the century. Marina: “Tom, this is not smart.” I practically stood up and applauded at that line.